Thanks to the generosity of the Fountain Pen Network member, Jared, I received set of ink samples. Among them were several vials of Rohrer and Klingner ink, which is a German brand that has recently become available in the US. I previously reviewed Morinda, which is a pretty, vibrant, candy-red ink. The second vial I opened was Verdigris, which is one of the more interesting inks I've had the pleasure of using. Historically, verdigris refers to the green patina that forms on copper, brass, or bronze as it weathers. Since the time of the ancient Greeks, artists have used that patina as a pigment, and it frequently was used in paintings. This Verdigris captures the character of a weathered bronze statue admirably. In the bottle, the green is quite pronounced, but it dries a dark, blue-green black on the page. It is of medium-high saturation, though not to the level of many Noodler's inks, and produces moderate shading, especially when used with a broad nib. The dry time was quick, coming in at 3 seconds on Rhodia paper, and even less on Staples Bagasse and garden-variety copier paper. It also exhibited acceptable levels of bleed-through on each of the papers I tested it with, though it did show-though quite a bit on all but the thickest of papers. Feathering was not an issue in each of my tests. The noticeable feathering on the decorative capital "V" on the writing example was due to my pen putting down far more ink than even the mighty Rhodia paper could handle. Verdigris is quite a lovely color, and is better behaved on the page than it's cousin Morinda. I have yet to test out other R & K inks, but if they're of the calibre of this one, then I will be quite pleased. 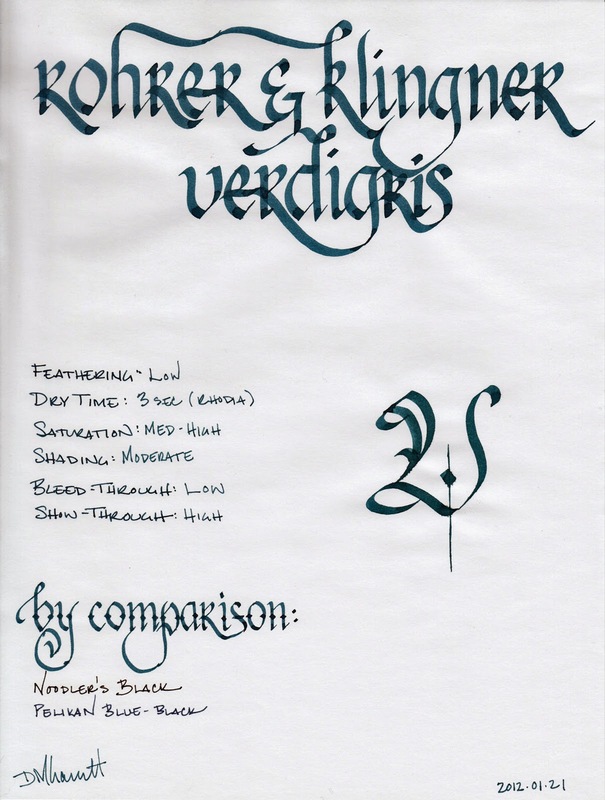 If you're a fan of uniquely colored inks, then Rohrer and Klingner is one you should definitely check out. Review notes: for the thin lines, I used a Lamy Safari with a steel EF nib. For the medium lines, I used a Lamy Joy with a steel 1.9mm italic nib. The broad lines were produced using a Pilot Parallel pen with a 3.8 mm steel nib. The paper is 80 gsm Rhodia.